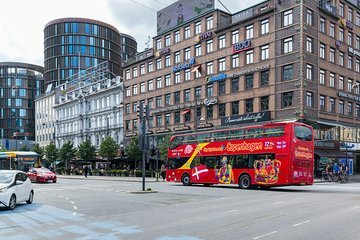 When your cruise ship sails into the picturesque city of Copenhagen, maximize your time in the Danish capital with a hop-on hop-off City Sightseeing tour. From the top-deck of a distinctive double-decker bus, see an array of legendary monuments and premier attractions while listening to informative audio commentary. Whenever an attraction captures your attention, disembark to explore further and then rejoin the sightseeing route at more than 30 interconnected stops. Choose between the Mermaid Route or three route option, both valid for 72 hours after first use. Your ticket is valid for 72 hours from first use. For specific cruise passenger information, please see 'additional info'. Climb aboard a distinctive double-decker bus at a conveniently located stop near your cruise pot (Stops 8 and 9) and embark on an exciting City Sightseeing tour. Use your 72-hour ticket to explore three interconnected routes, all of which travel to some of the Danish capital’s most spectacular sites. Clamber up to top-deck for the Mermaid Tour, a route that ventures to cultural and historical highlights like The Little Mermaid, Rosenberg Castle and Amalienborg Palace. Take the combination tour in the spring and summer months to see popular attractions like the Carlsberg Breweries, the grand Theater district, the Zoo and the ancient Frederiksberg Castle. Opt for the Christiana Tour to see modern masterpieces like the Black Diamond and the charming neighborhood of Christiana. Each route lasts approximately 1 hour. This excursion is located within a 20-minute walk to the cruise port, so you determine the time you return to your ship in Copenhagen. Please allow yourself ample time to enjoy the excursion and ensure your timely return to the port. This excursion is not covered by our worry-free policy. Please see the Itinerary section for a full list of all stops serviced by the route. Guests are reminded to check with their cruise line as to which port their cruise ship will be arriving into Copenhagen. will have access to City Sightseeing shuttle buses to join the Mermaid Route at the Little Mermaid. A return shuttle will be available from Stop 6, Little Mermaid. This service will only be free of charge with a City Sightseeing Copenhagen ticket and guests will be required to show their cruise identification as Frihavn and Oceankaj are restricted ports. will be able to join onto the Mermaid Route every half-hour. From Stop 1 it will take guests approximately 45 minutes to get back to the ship. will be able to join directly onto the Mermaid Route every half-hour. Guests will be required to walk approximately. 200 metres to Stop 5. I used this service to get to all the places I wanted to visit during my three days in Copenhagen after disembarking my cruise. Be sure to pay attention to signs and times and you'll have a wonderful time! I would look for the other hop-on and hop-off tour company. It was very confusing, as we were only allowed to use buses that said stromma on them, even though all the buses were red and said hop-on hop-off on them. These buses ran much less frequently than the other bus line. We had limited port time, and their first pick up time was 10:00 a.m. Viator also only sold a two day pass, which would include a river tour, which is ridiculous when you only have a few hours in port. We did not have the time to do more than loop around the city once. You may want to research this one more carefully before booking, it was a waste of money the way we did it. Transferred from cruise terminal to the centre of Copenhagen for the hop-on hop-off tour, immediately supplied with ear phones for the full experience of the history of Denmark. Very friendly drivers and comprehensive map of the city. Whilst the little mermaid is an iconic symbol of Copenhagen, take time to walk around the nearby park and windmill. We took the Hop On Hop Off tour in Copenhagen. We took a shuttle bus to a central location and switched to the Red Bus. The traffic was so horrendous that we never made it around one loop by the time we had to go back to our ship. We had wanted to see the Old Town and when we ask the agent which stop to get off, she had directed us to the Shopping Promenade....something we can find anywhere!! So....our whole day was spent in very frustrating traffic, on a shopping promenade where we spent 60 for a terrible lunch and then finally catching a glimpse of the Little Mermaid before rushing back to the ship. Totally disorganized...at one stage left sitting on the bus for 20 minutes while the driver took a break!! Couldn't get back on the bus to return to the cruise ship because it was overwhelmed. Dreadful experience. Using the Hop-on Hop-off to see Copenhagen was a great way to get around and hear a narrative of the city at the same time. Using the hop-on hop-off as a mode of transportation and hearing historical information about the city is priceless. The Hop-on Hop-off was a great way to people watch at the same time. I would use the hop on hop off offered by Viator again if any city around the globe if it was available. Just a basic around the city tour.